In a memo written to the United States Senate and the U.S. House of Representatives, the 10th Amendment Foundation explains why Congressionally imposed national health care is unconstitutional. 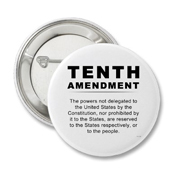 The 10th Amendment was set up to provide us with a LIMITED federal government and so it said that all powers that were not given to the Federal Government by the Federal Constitution, were denied to it and reserved to the States OR TO THE PEOPLE. Any country that doesn't abide by a "Rule of Law" will be governed by the rule of a man. Any country governed by the rule of a man will become one ruled by a man who becomes a tyrant (as Nazi Germany and Soviet Russia proved). The ultimate rule of law in the United States comes down to The U.S. Constitution and the Bill of Rights. Because the Founders understood that the further a government was from the people the less power it should be given, and the more relative power constituent governments should have, because they are closer to the governed. In addition, the more power given to a big central government, the more power that government would have over the people (with a lessening of individual freedoms) in order for it to control the masses. Read the rest of the memo here. I was certain that such action as this was being prepared. If such action is not affirmed, it wouldn’t mean that health care legislation is constitutional. It would mean that the federal government had utterly slipped constitutional constraint.